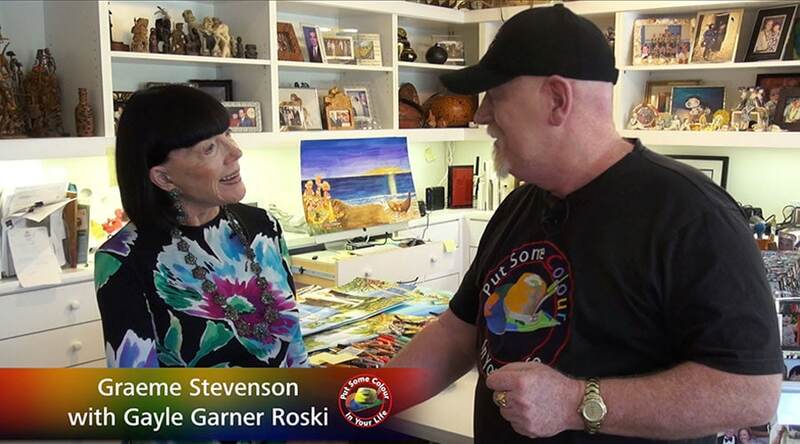 Watercolor, according to Gayle Garner Roski, is a “medium of magic.” With watercolor you never know exactly how it will come out, as you cannot rework what you have already done, she explains. She has created several series of paintings from objects found in her travels around the world: calligraphy brushes from Beijing, Italian pottery from Tuscany and Umbria, and a snuff bottle from China. In 2014, she created a Zulu basket painting that won the Jesse Arms Botke Award at California Art Club’s 104th Annual Gold Medal Exhibition. Gayle Garner Roski has illustrated five books: Luscious, the University of Southern California’s cookbook; Thomas the T. Rex: The Journey of a Young Dinosaur to Los Angeles, written by Michael Smith; Mei Ling in China City and Mystery of the Giant Masks of Sanxingdui, both written by Icy Smith; and Endeavour’s Long Journey, written by astronaut John D. Olivas.